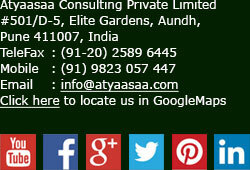 Atyaasaa Online is an expansive initiative for taking our body of knowledge rapidly across continents. This initiative will continuously add various learning titles of relevance to the dynamic market place where we operate in. Learning titles are developed through Atyaasaa’s intensive research and delivery mechanism and thus will resonate with every future oriented aspiring corporate professional.